I found this poem in my grandmother Fannie Turner Graham’s large scrapbook. She just pasted stuff in there without much rhyme or reason. Edward McCall, who was a poet and publisher, was her first cousin. Her mother Jennie and his mother Mary were sisters, both Eliza’s daughters. I remember seeing Jo Mendi ride around the ring at the Detroit Zoo in the 1950s on one of our annual Graham family Zoo trips. 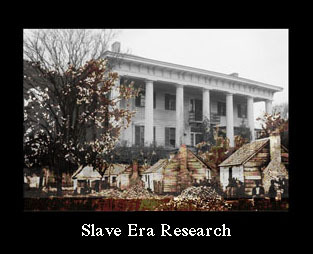 The note in my grandmother’s scrapbook says he died in 1934, but the photo I found on the webb says it was taken in 1950. 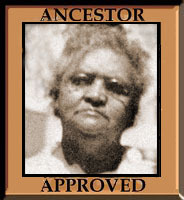 It turns out there were 4 of them and you can click here for their stories The True Story of Jo Mendi. And here for a Chimp Trainer’s Daughter telling about the brutal side of training chimps. James Edward McCall, Poet and Publisher. You gave me an idea–I have some postcards of the monkeys performing at other zoos. Glad to do it. I really did not have any hurdy gurdy men in my family. Probably a few crying girls but I don’t really want to highlight their tears. 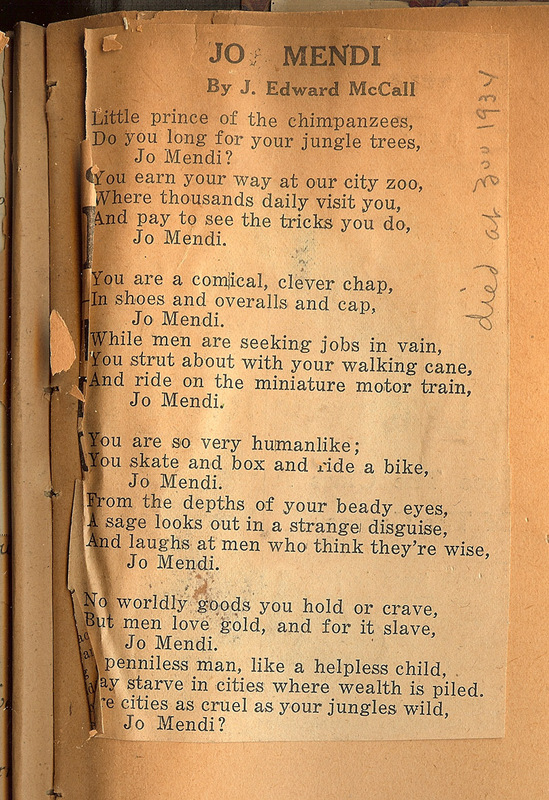 Maybe Jo Mendi was such a success that when he died they just substituted another chimp with the same name. That’s exactly what they did. Turns out there were 4 of them. I added a couple of Jo Mendi links up there. Cute pictures of Jo Mendi – whichever one each represents – 1, 2, 3, or 4 ? The poem was an extra nice touch. To me the poem was the main thing. The photos were the extra touch. How sad for all the Jo Mendis. The poem at least acknowledges that he/they were deprived of their natural habitat. That photo of Jo Mendi on the bike reminds me of the chimp that used to be somewhat of a regular on the old Ed Sullivan Show. 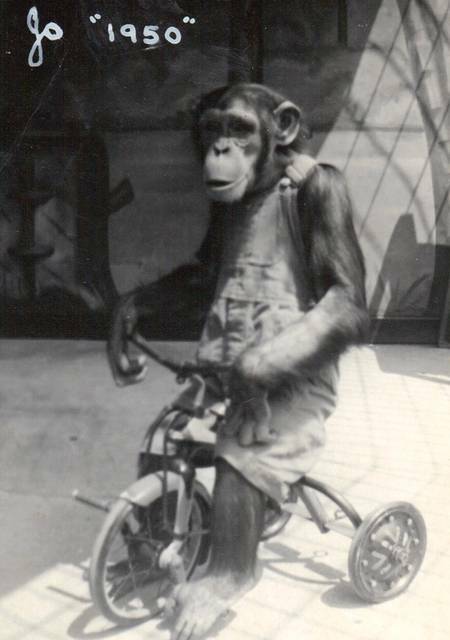 I doubt today’s audiences would find much pleasure in watching a monkey ride a bike in circles. I love your header!! Monkeys are so cute!! Oh, this was the perfect post for this week’s prompt. I love the poem. But it makes me sad to think how the chimps were trained. Never heard of Jo Mendi, but I remember the monkey on Ed Sullivan! I’ll bet they did the same thing with Jo that they did with Lassie — there were a bunch of ’em, all named the same! You’re lucky to have access to such family writings. We didn’t see any monkeys or chimps at Detroit Zoo last year – just a huge gorilla. Super poem – I am not a fan of training wild animals to perform for us. I’m not a fan of that either. I’m not even a fan of zoos any more. Didn’t you do well with the meme? I doubt I will have such luck. By the way Kristin I always enjoy reading your posts so have nominated you for the “One Lovely Blog Award”. Please don’t feel obliged to participate but I hope that you get more readers and enjoy basking in the recognition. Thank you Alex! And thank you for the award. 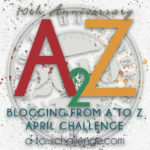 I decided awhile ago to be an award free blog, but I do appreciate the sentiment. Interesting poem in your grandmother’s scrap book. That’s just what scrapbooks are for: assorted things that appeal to the owner. Hopefully, we treat all zoo animals better today; letting them lead more natural lives rather than dressing them up and having them act like people. I don’t even like zoos any more. For some years they’ve seemed like animal prisons to me. I enjoyed reading the poem. I’m not sure what year the poem was written, but in many ways the sentiments/metaphors seem like they must have been cutting edge when they were written. Sheryl, my grandmother started her scrapbooks after her youngest son Howard died in 1932 and she says that Jo Mendi died in 1934 so I would guess between those times. Unless she had them saved around and just pasted them into the book at that point. I wish I had an archives of my cousins newspaper, where these were all published. Even though Joe Mendi is long gone it’s nice to have been introduced to him. Makes me think back on seeing Smokey the Bear at the National Zoo in the 50s. I remember a ranger coming to our school in Maryland to tell us all about him. I then of course begged my folks to take me to see him.